In the eighties mountain bikes were known as ‘all terrain bikes’, a term that lives on today in the French for mountain bike – velo tout terrain. But in recent years the concept of a bike that could go anywhere has fallen by the wayside, mountain biking has become increasingly specialised, and the bikes have become more limited in the terrain they can handle. However, in the last decade a new type of bike, the fatbike, has emerged from almost total obscurity to become the fastest growing segment of the bike market. The fatbike, a true all terrain bike, looks similar to a conventional mountain bike except for its oversized tires. These super wide tires (between 4 and 6 inches wide compared to just over 2 for a standard mountain bike) give the bike unparalleled grip on loose and rough surfaces such as snow, sand, rocks or mud and are the key to the fatbike’s ability to go almost anywhere. In 1987 the first Iditabike, a bike version of the famous Iditarod dog-sled race, was run. The racers, riding conventional mountain bikes, struggled in the deep snow so they began experimenting with ways of improving their bike’s floatation. Simultaneously down in New Mexico Ray Molina, a bike tour guide, was building his own custom rims and wheels to allow him explore the dry stream-beds and sand dunes. These home-brew bikes were the first generation of fatbikes and for over a decade fatbiking grew slowly, a niche within a niche, but everything changed in 2005 when Surly, an innovative bike company from Minnesota, released the first mass produced fatbike. Since then they have become increasingly mainstream, now it seems that every mountain bike manufacturer wants to have one in their range. However, outside of the winter months in certain parts of North America, fatbikes are still a rare sight and there are probably less than a dozen in Ireland. After doing some research I got in touch with Garry Davoren, one of the few Irish fatbikers. 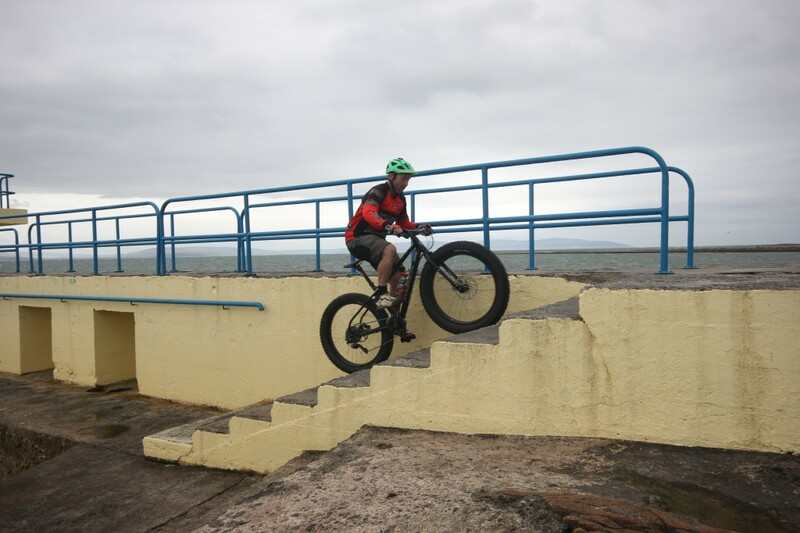 Davoren, 38, from Galway is a co-owner of Moycullen Bike Works and has been mountain biking since his mid-teens. He first saw a fatbike in the flesh at a race in British Columbia, “That really opened my eyes. From then on I had a fascination with them. It was always at the back of my mind that they would be perfectly suited to the terrain we have here. So I got a bike from Kona last year and it exceeded my expectations”. “Here in Connemara you are quite limited in where you can ride your bike. So it’s great to be able to ride the shoreline and soft ground in the hills. It can handle the bike trails as well as doing everything else. Even a beginner can pick it up fairly quickly”. The Wo is an elegant bike, with an understated black paint job but the tires still stand out like a sore thumb. The fatbike is the monster truck, or the Massey Ferguson of the bike world, something of a monstrosity but once I throw my leg over it I realise is that it doesn’t feel all that different from a normal mountain bike. On tarmac the tires certainly hum but on really rough ground they come into their own. As we cycle south along the beach, Davoren rides up and down everything in sight – steps, rocks, walls. I’m a little more cautious but the bike handles the different surfaces – deep soft sand, loose shingle, seaweed covered rocks – without any problems and as long as I keep pedalling it just ploughs ahead. Later on we move inland to some of Davoren’s local trails. The riding here is completely different, on very narrow tracks through forest, with plenty of rocks, slippery roots and steep banks. Watching Davoren use a combination of power and technique to get the bike up and down some incredibly steep sections is a great illustration of what these bikes are capable of in the right hands. As a way to demonstrate the fatbike’s versatility Davoren has ridden his in many races, much to the amusement of his fellow racers. He has got some very respectable results including winning rounds of the Biking Blitz and the Connacht MTB League. A week after our Galway spin I meet up with Davoren and his club-mate Neil Martin. 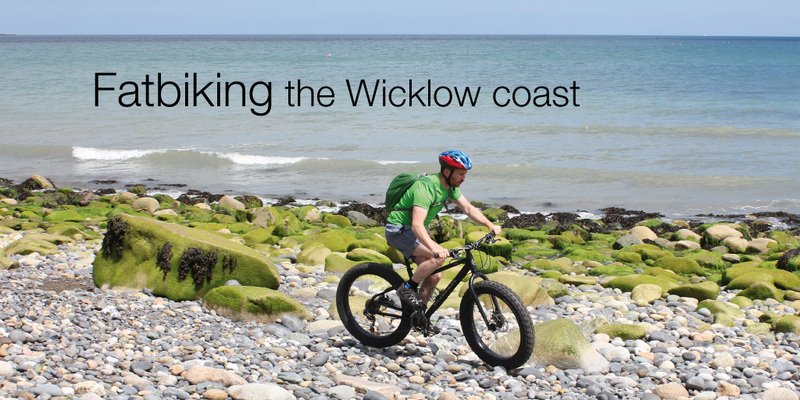 Our plan is to fatbike along the coast from Killiney Beach to Wicklow Town. 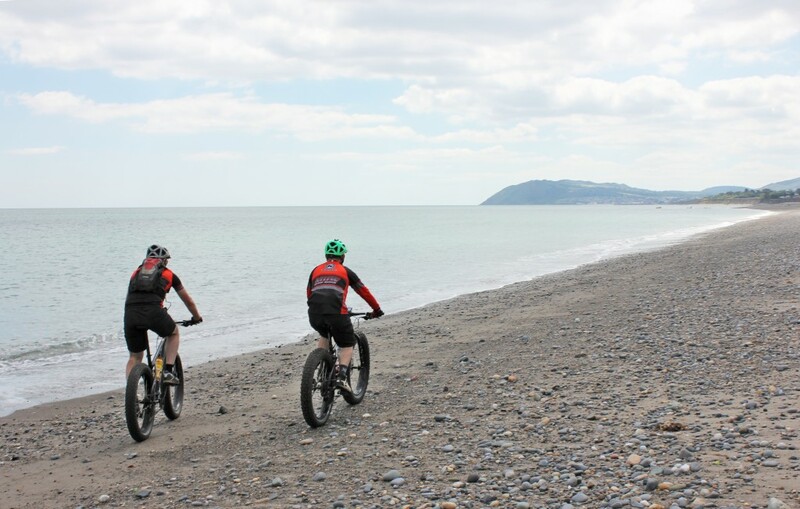 It’s a sunny day and we get more than a few bemused looks from the sunbathers as we pedal along the loose shingle on Killiney Beach. 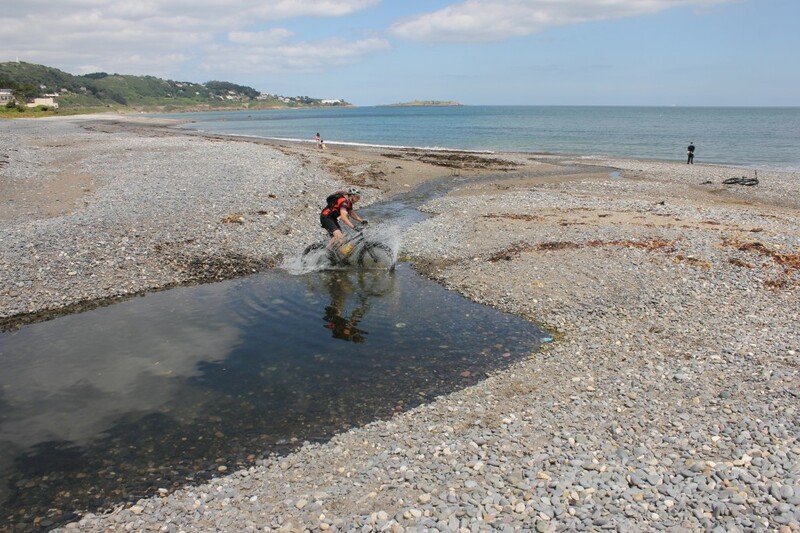 Once we splash across the Loughlinstown River the ground gets rockier, it takes an all-out effort from me to get through the last section before Bray Harbour without putting a foot down. We fly along the beach in Bray which is packed with people enjoying the good weather. Again we get plenty of funny looks but we are moving too fast to entertain any questions. 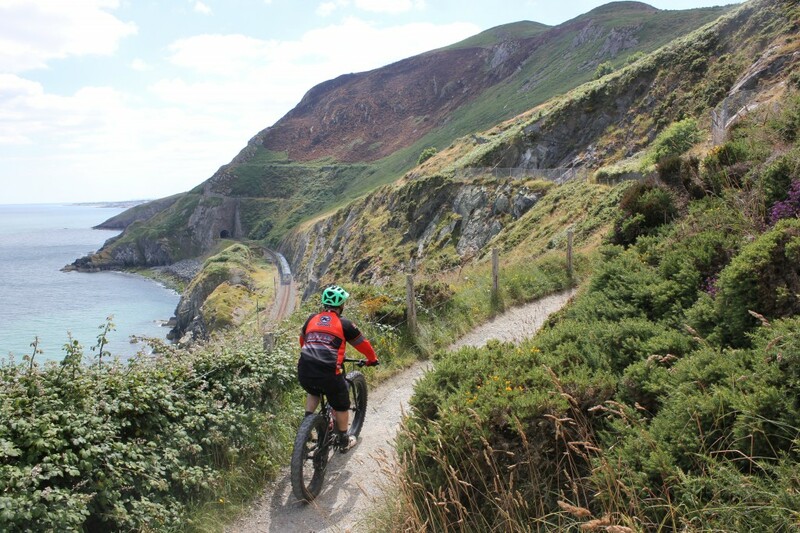 The cliff path around Bray Head is spectacular but fairly easy going and it isn’t long before we arrive in Greystones. 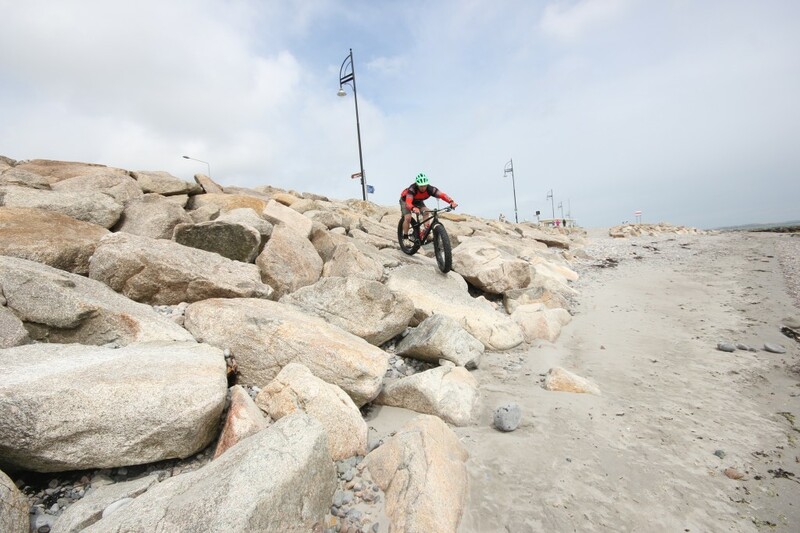 As soon as we set wheels on the beach just south of Greystones it’s apparent that the pebbles are too loose to cycle for any great distance The only option is to ride on top of the sea wall which consists of large concrete blocks about a meter wide. We follow the wall for miles, at a few points I’m forced to get off the bike but the others are able to use their vastly superior skills to bunny-hop and wheelie across every gap and drop. Gradually the terrain changes and the wall gives way to a narrow, sandy path. The frequent sections of loose sand, that would bring a conventional bike to a sudden halt, don’t bother us and we are able to keep the momentum up. It’s only in the last few kilometres that the trail improves and it isn’t long before we arrive in Wicklow Town, a this stage fairly oblivious to the strange looks we are getting. When I suggested this route I thought that there would only be a few short sections that would be ridable only a fatbike but in the end we estimated that about half the route’s 37km length would be extremely difficult, if not impossible, on a conventional mountain bike. But fatbikes aren’t just for messing around on the beach, they are serious machines capable of doing things no other vehicle can. In 2005 Jakub Postrzygacz rode his fatbike the full length of the 1850km Canning Stock Route in Australia. The route which crosses the remote and inhospitable deserts of Western Australia, was established in 1910 to allow Kimberley cattlemen to transport their cattle to market in Perth. Amazingly Postrzygacz’s crossing on fatbike was the first unsupported crossing of the route by any vehicle. 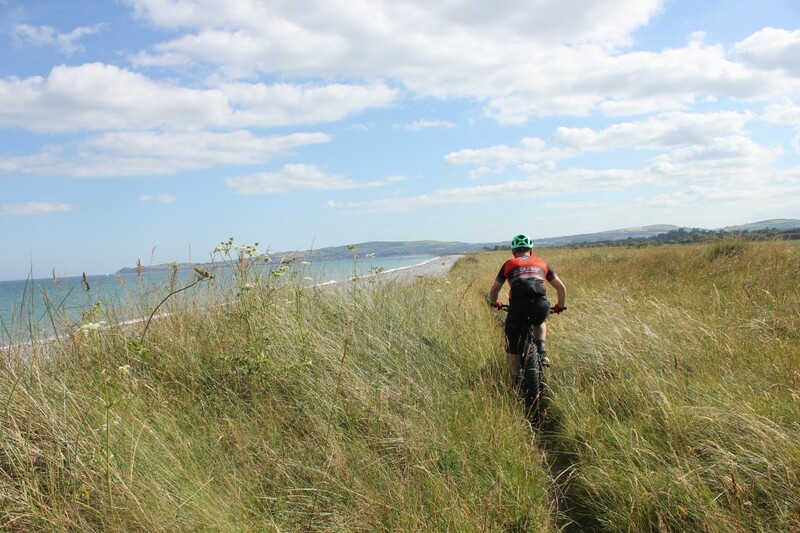 Inspired by Postrzygacz’s feat, Tom Walwyn fatbiked the Canning Stock Route in 2013. Walwyn, 40, a Paediatric Oncologist from Fremantle, Western Australia, was already a very experienced long-distance cyclist, having previously spend two years cycling the length of the Americas from Canada to Patagonia. Riding unsupported Walwyn carried 20kg of food and up to 28 litres of water. “The Canning Stock Route has been ridden using a conventional mountain bike but to pull and carry the weight of food and water required for an unsupported trip is impossible with a conventional bike”. To carry these massive loads Walwyn used a single wheel trailer while his companion Scott Felter used a long-wheelbase fatbike, basically an elongated frame that has more room for luggage. 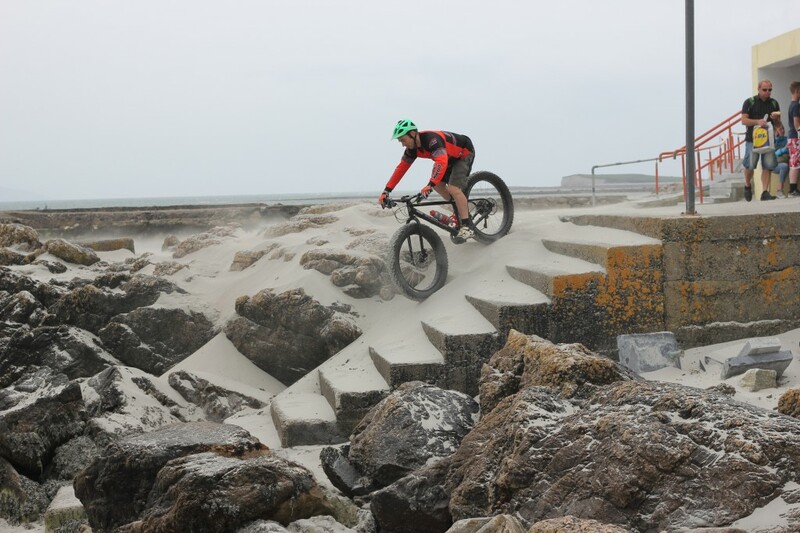 The rough terrain, composed of extremely rutted 4×4 tracks, soft sand and massive dunes, is ideally suited to fatbikes “ They give ‘float’ that allows many more sections to be ridden rather than pushed. Those dune tops that are pushed are easier with fat tyres as they don’t bury themselves in soft sand the way standard mountain bike tyres do“. While incredibly practical machines, fatbikes are first and foremost fun, yes there are faster, lighter bikes out there, but if you are looking for a simple, tough bike that can go almost anywhere then they can’t be beat. The huge tires give the bike give plenty of grip on wet, muddy trails in the winter as well as a very stable, predictable feel that beginners will inspire confidence in beginners. Hey David. Great post.. I rise and race my lovely fat bike here in beautiful Co wicklow and I’m planning a few fatbike adventures later in the year. Feel free to get in touch as it’d be great to have a few other fatbikers in the loop. If you guys are planning another East coast trio consider this an official invite if ya need a base to ride from! Hope to hear from ya!